Join me in saying Thanks to the state of South Dakota for sending Ronald Backer our way. It’s as if the Great Plains groomed this artist just for us–salting him with treks to Spirit Mound and seasoning him with the lore of Deadwood. They wrapped him in tradition and delivered him to Palm Desert with the specific task of bringing Americana to the Coachella Valley. The poor man doesn’t know what he’s up against. With metal sculptures in the medians, Chihuily glass anemones in the galleries and Donald Judd’s minimalist bunkers occupying the new museum—it’s clear that the modern rules this young city. In contrast, when I went to visit Backer and his wife Elie Marty at home recently, I felt like I was paying a call on Norman Rockwell and Tammy Wynette. Ron paints like the great illustrators of the early 1900s; Elie is an equally rootsy country music composer and singer. The couple collaborates on everything, so the paintings morph into ballads and ballads into paintings. I knelt on the floor to study Backer’s new Coachella Valley paintings propped here and there against furniture and walls. Here were the stories I knew—the Bradshaw stage, the old county well in Indian Wells—melded with the landscape I love. Here was someone else who sees how the stories and landscape of the Coachella Valley are resoundingly intertwined. Like the late Carl Bray, who provided ongoing yarns for each of his paintings, Backer offered a running commentary on the characters in each painting as I trailed him around the house. “Story paintings,” he calls them. In the same room, above the copier, a woman steps off the Deadwood stage in one of Backer’s South Dakota paintings. The prairie and the desert collide everywhere in this house. 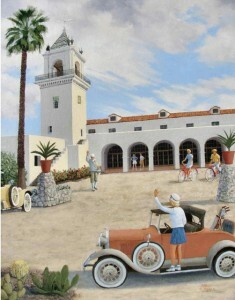 Ron Backer with a painting honoring Palm Desert history. Photo by Elie Marty. Ron was born in Worthing, South Dakota in 1922. As a boy he milked cows and skied to a one-room schoolhouse in winter. As a young man, he attended the Fred Archer School of Photography in LA but his artistic interests were put aside while he raised two sons with his late wife, Mavis Thompson. After his wife was killed in a car accident in 1973, Ron became reacquainted with the girl next door. Elie Marty was hanging clothes on the line at her mother’s house in Centerville, south of Sioux Falls, one day. Ron was sitting on a bench under the cherry tree next door. Elie’s mom, watching through a window, hollered “Minnie’s son is home!” The couple was married in 1977. Ron retired from NASA in 1979, determined to be an artist. 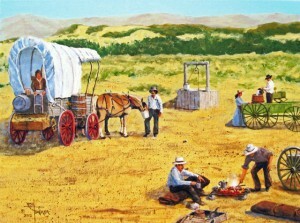 He and Elie moved to California; he took art classes at Laguna Beach School of Art and the Otis Art Institute, as well as attending workshops sponsored by the Cowboy Artists of America. Though gaining ground as an artist, he was still groping for a direction: “Where do I belong? What am I going to do?” One day in 1988, on a return visit to South Dakota, he and Elie climbed Spirit Mound, a prominent landmark on the Lewis and Clark expedition. Leaning into a hot prairie wind, they snapped photos and took turns posing as expedition members wielding make-believe muskets. 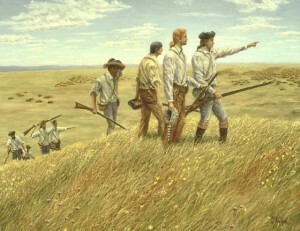 The painting Ron made from the photos—Lewis and Clark’s Spirit Mound—was reproduced as limited edition prints and sold to raise money for the preservation of Spirit Mound. 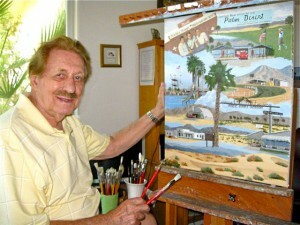 The National Park Service liked Ron’s paintings so much, they incorporated them in their kiosk at the site. The popularity of his Spirit Mound paintings gave Backer his focus. 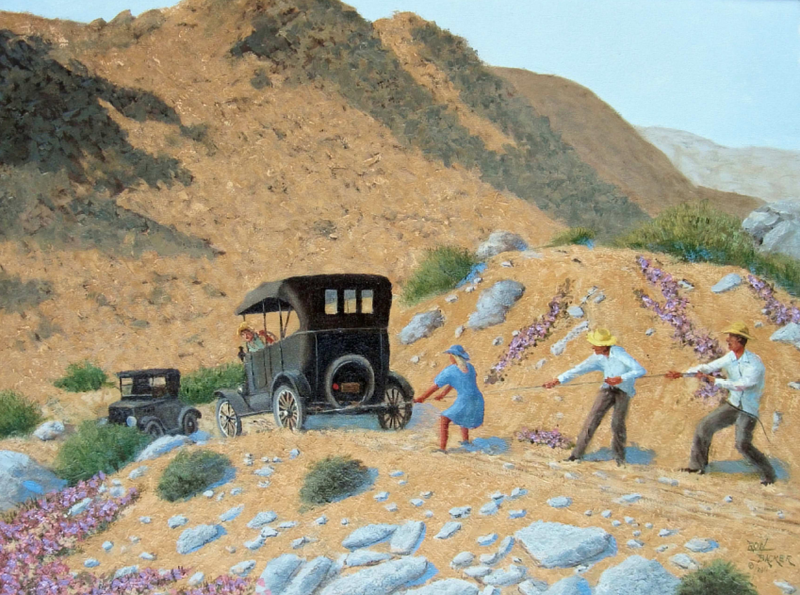 He would paint like the great historical illustrators he admired, Mort Kuntsler and Harvey Dunn (also a South Dakota lad). “I said, OK, this is where I belong.” It was not a trendy choice. Narrative historical paintings (the equivalent of epics in literature) were popular in the 18th century. The genre became prominent again in the early 1900s, the golden era of book and magazine illustration. But since then the scene has mostly fizzled, aside from a small clique of men who paint Civil War battles. 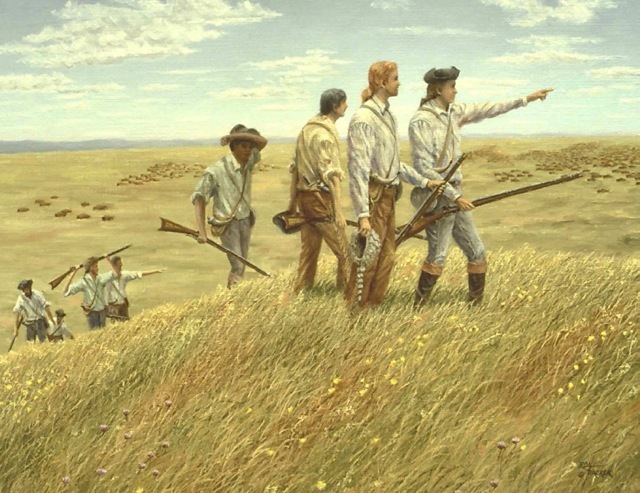 The bias against narrative painting is so great that Backer has heard potential buyers say: “If you didn’t have a person in that painting, I’d buy it.” Yet South Dakotans appreciate his efforts. He was inducted in the South Dakota Hall of Fame in 1996 as “Artist of the Year”. While “folk art” and “primitive art” can be pejorative terms these days, Backer’s paintings are decidedly non-slick and non-academic. In their focus on characters and stories, they indeed have a lot in common with folk songs and ballads. Great article, hope all is well. Wonderful article, Ann. Thanks so much for putting into words a hint of what this lovely couple has to offer our valley. Having visited their home and seeing such unique works of art everywhere, I so look forward to what lies ahead. 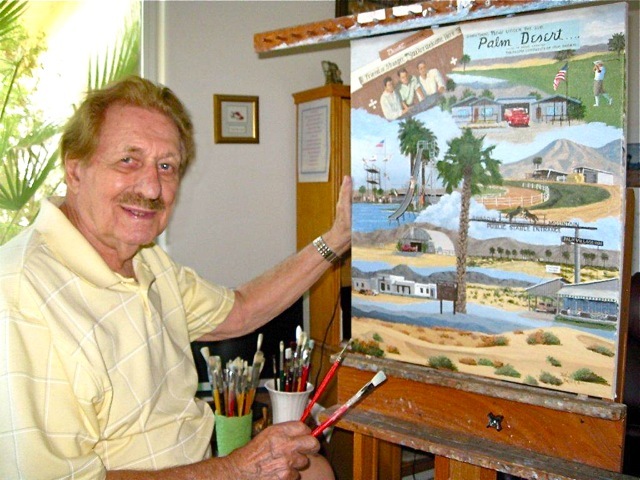 South Dakota’s loss is California’s gain, but we still treasure Ron, Elie,and his art. Your artwork gets better and better, if that’s possible. I am about to fall in love with your desert pictures, just as I did with your South Dakota ones. My favorite just might be “Almost There” because of that great old car. Happy Thanksgiving!